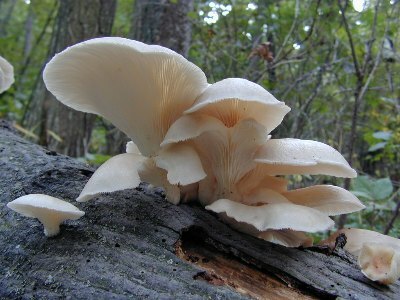 Oyster Mushroom, a fungus that comes from the Netherlands. According to WHO, the oyster mushroom meets the health standard, even oyster mushrooms have a whole range of benefits for human health. Oyster mushrooms have a protein, vitamins, and minerals are quite high. Besides it is more important to note is the amino acid content essensialnya. Of the 20 essential amino acids, 9 species there are in the oyster mushroom. Essential amino acids are amino acids that are not produced by the human body. This essential amino acid is very useful for the human body's metabolic processes. Nine essential amino acids contained in the oyster mushrooms are: lysine, methionin, trypthofan, theonin, valine, leucine, isoleucine, histidine, and phenylalanine. Vitamins are found in oyster mushrooms are: B1 (thiamin), B2 (ribovlafin), niacin and biotin. While the oyster mushrooms for their mineral containing potassium, phosphorus, Ferrum, Calcium, Sodium, Magnesium, Cuprom and others. Oyster mushrooms are healthy snacks and healthy, because it is free of pesticides, fertilizers, and other chemicals. In every 100 grams oyster mushrooms, there are 367 calories, 10-30% protein, 56% carbohydrate, 17% fat, and much more. Oyster Mushrooms calories are contained kj/100 is 100 grams with 72 percent saturated fat. Oyster mushrooms contain fiber content up to 24% so it is perfect for dieting. Some of the benefits that oyster mushrooms are owned by lowering cholesterol, anti-bacterial, and anti-tumor so that oyster mushrooms are also widely used to treat variety of diseases ranging from diabetes, liver, and other. For those of you who want to lose weight can also eat the oyster mushrooms because many contain fiber. Some say that the oyster mushroom is not well taken by people who have gout disease, but new research proves that the oyster mushroom does not result in gout or negative side effects of gout.